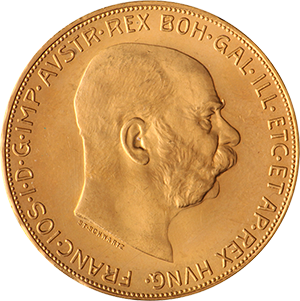 These Austrian coins with the Austrian Emperor Franz Josef and the Austrian coat of arms on the reverse, are extremely popular with the European market. Corona gold coins are one of the most historic items in the world of numismatics (coin collecting). 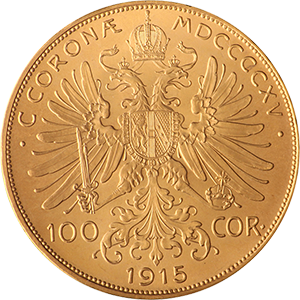 The Corona (or Krone, Krona, Korona) depending on the location, was the main currency of the Austro-Hungarian empire, which collapsed during the First World War. This gives the coins minted in the latter era of the empire a special poignancy that makes them especially popular with collectors. The Austrian 100 Corona coin itself is part of a set of standard releases that included the 20, 10, 5, 2 and 1 Corona coins. Due to a loophole called the “Grandfather Clause”, Austrian 100 Corona Gold Coins are still being minted with the year 1915 on them that allows private ownership of the coin. These new releases are essentially standard gold bullion coins in the mould of the South African Krugerrand and are extremely popular due to their purity and historic connotations. It is these re-issues that collectors are likely to come across, with the originals rather rare and more valuable. The gold content of the Austrian 100 Corona is extremely high, just under the purest on the market at 23.527 carats. This means the coin is made up of 98% fine gold. Such high content of fine gold does mean the coin can be malleable and easily marked, but due to the fact that the coins are just short of the 24 carat mark, they are more hardy than some newly released gold bullion coins. Due to the fact that the Corona gold coin is a both an original and a re-issue, some vendors have taken advantage of the confusion. It is therefore important to buy gold from a reputable source. Goldinvestments.co.uk is one of the oldest and most renowned traders in the UK, with an office based customer service team on hand to offer advice on all precious metal trading topics.